8111. 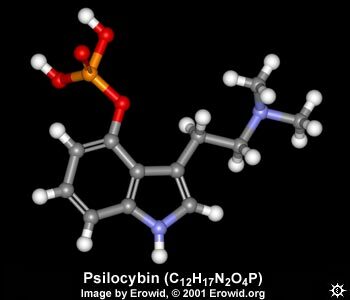 Psilocybin. 3-[2-(Dimethylamino)ethyl]-1H-indol-4-ol; O-phosphoryl-4-hydroxy-N,N-dimethyltryptamine; Indocybin. C12H17N2O2P; mol wt 284.25. C 50.71%, H 6.03%, N 9.86%, O 22.51%, P 10.90%. 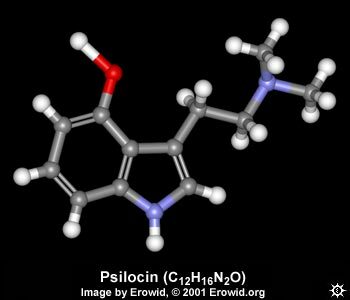 The major of two hallucinogenic compounds in Teonanacatl, the sacred mushroom of Mexico, the other component being psilocin, q.v. from the fruiting bodies of Psilocybe mexicana Heim, Agaricaceae: Hofmann et al., Experientia 14, 107 (1958); Heim et al., Helv. Chim. Acto 42, 1557 (1959); Heim et al., Ger pat. 1,087,321 (1960 to Sandoz). Structure: Hofmann et al., Experientia 14, 397 (1958). Synthesis: Hofmann, Troxler, U.S. pat. 3,075,992 (1963 to Sandoz). Crystal structure: H.P. Weber, T.J. Petcher, J. Chem. Soc., Perkin Trans. II 1974, 942. 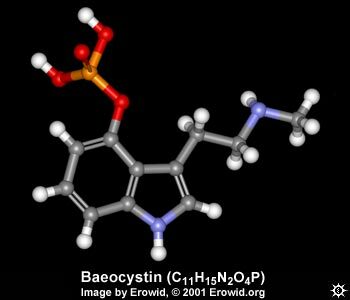 Converted to psilocin in vivo. Toxicity data: E. Usdin, D.H. Efron, Psychotropic Drugs and Related Compounds (National Institute of Mental Health, Rockville, Md., 2nd ed., 1972) p 138. Reviews: Hofmann, Proc. 1st Int. Congr. Neuro-Pharm., Rome 1958, 446; Cerletti, Deut. Med Wochenschr. 84, 2317 (1959); Hofmann, Bull. Narcotics 23, 3 (1971). Crystals from Boiling water, mp 220-228°; from boiling methanol, mp 185-195°. uv max (methanol): 220, 267, 290 nm (log E 4.6, 3.8, 3.6). pH 5.2 in 50% aq ethanol. Sol in 20 parts boiling water, 120 parts boiling methanol; difficultly sol. in ethanol. Practically insol in chloroform, benzene. LD50 in mice, rats, rabbits (mg/kg): 285, 280, 12.5 i.v. (Usdin, Efron). Note: This is a controlled substance (hallucinogen) listed in the U.S. Code of Federal Regulations, Title 21 Part 1308.11(1995). Plates from methanol, mp 173-176°. Amphoteric substance. Unstable in soln, esp. akaline soln. Very slightly sol in water. uv max: 222, 260, 267, 283, 293nm (log E 4.6, 3.7, 3.8, 3.7, 3.6).